It's a busy Blue-White Weekend around the area. 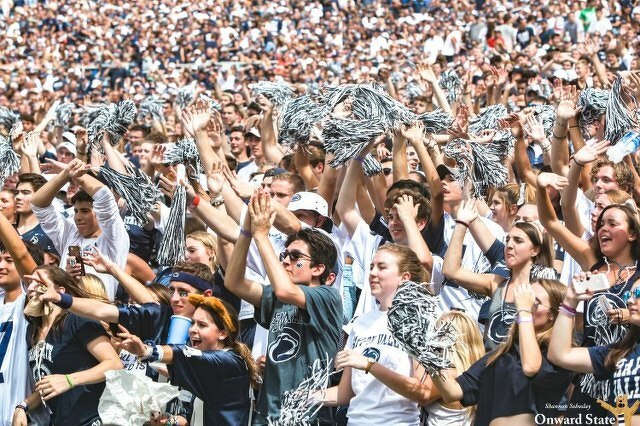 There's plenty of festivities surrounding the spring football game at Beaver Stadium, but there's much more to check out, too. A food truck festival, Easter egg hunts, concerts, theater, sports and much more are on the schedule throughout the weekend. We've compiled some of the highlights below. Walker Township Fire Company, 125 Firehouse Lane in Hublersburg, hosts its second annual wood carving and craft show, starting at 8 a.m. Friday and Saturday. Food will be available each day, and quick carves are scheduled for 6 p.m. Friday and 1 p.m. Saturday. The indoor craft show is on Saturday and the event wraps up with a wood carving auction at 6 p.m. Saturday. Baseball vs. Nebraska, 1 p.m., Medlar Field; Softball vs. Rutgers, 1 p.m. Beard Field; women's tennis vs. Indiana, 4:30 p.m., Sarni Tennis Center. Benefiting the nonprofit House of Care assisted living facility, the Food Truck Festival will be held from 4 to 8 p.m. at Grace Lutheran Church, 205 S. Garner St. The festival will feature The Potato Coop, Doan's Bones BBQ, Brazilian Munchies, Taco, Inc, Rosie's Pierogies, Salúd Kombucha and more. This free, kid-friendly event, from 6-9 p.m. at the Bellefonte YMCA, will celebrate all of your favorite superheroes with fun activities and events designed for kids ages 3 to 11 years old. Create your own comic book, show off your spidey-skills with Spiderman on the rock-climbing wall or enjoy some refreshments The night will finish with an epic heroes vs. villains dodgeball match that will put everyone’s superhero powers to the test. Sold out, but limited overflow seating and wait list registration is available for the two-night festival at the State Theatre. From adrenaline-fueled action sports, to an exploration of wild landscapes and remote mountain cultures, films in this year’s Banff Centre Mountain Film Festival World Tour are sure to captivate the explorer within you. Films include "For the Love of Mary," about 98-year-old State College runner George Etzweiler. Doors open at 6 p.m. both nights. Class Act Productions presents the story of Annie Sullivan as she brings light and understanding to her pupil, Helen Keller, who is both deaf and blind. Shows are 7 p.m. Friday and 2 p.m. Saturday at State College Assembly of God, 2201 University Drive. Tickets are $15 for adults and $5 for children. Ferguson Township Lions Club also will be collecting eye wear for the Eyeglasses Recycling program. Penn State Centre Stage performs "To Kill a Mockingbird," a stage adaptation of Harper Lee’s Pulitzer Prize-winning novel, at 7:30 p.m. in the Playhouse Theatre. Buy tickets here. 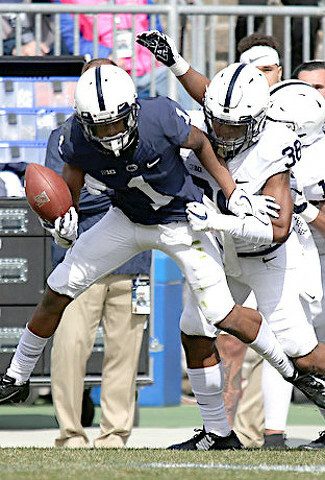 Penn State annual spring football scrimmage kicks off at 3 p.m. Saturday inside Beaver Stadium, but there's more to check out before the game. Lots open at 8 a.m. and the Blue-White Boardwalk will take place from 10 a.m. to kickoff. The "boardwalk" will feature a Ferris wheel and giant slide, caricature artist, photo booth, food vendors, live music, and fun and games with student-athletes from six teams. The team buses arrive at 11:30 a.m. and the always popular player autograph session will be from 12:15 to 1:05 p.m. at Gates A, B, C, E and F.
Baseball vs. Nebraska, 3 p.m. (DH), Medlar Field; Softball vs. Rutgers, 5 p.m. Beard Field. - Calvary Harvest Fields, 150 Harvest Fields Drive in Boalsburg, hosts a free breakfast at 8:30 a.m. followed by an Easter egg hunt, beginning at 10 a.m. sharp. Photo booth, children’s crafts/activities and a special visit from the Easter Bunny. - Mount Nittany United Methodist, 1500 E. Branch Rd., will have a morning of activities, with registration at 8:45 a.m. and breakfast at 9 a.m. A bunny will be available for pictures from 8:45 to 9:30 a.m. At 9:30 a.m. there will be activities for children that include crafts, a nesting egg story, "minute to win it" games, a science experiment, a little magic -- and of course a huge Egg Hunt. - The Hearthside, 450 Waupelani Drive, will hold an Easter egg hunt at 2 p.m. for kids ages 0 to 12. Stop by to meet the Easter Bunny and have some cookies and punch. Hosted by the Penn State Renaissance Club, the annual Renaissance Faire — 10 a.m. to 6 p.m. at Sidney Friedman Park — will feature performances of Shakespeare scenes, weapon demonstrations, a live human chess match and more, along with craft and food vendors. Free to attend and open to all. Join Bellefonte High School's Senior Institute Class for their third annual Pet-Friendly 5K at 10 a.m. at Bellefonte Area Middle School, 100 N. School St. Walk, run, or bark your way to the finish line to help support this class as they raise money for a community member who battled cancer. Prizes will be awarded for winners in 18 and under, 19-34, 35 and above. All pets will be provided with a goodie bag, while human participants will be provided with water and snacks. Registration here or day of at 9 a.m.. Presented by Penn State Thespians, join Winnie the Pooh and friends as they embark on yet another journey through the Hundred Acre Wood. Performances are at 11 a.m. and 1 p.m. Saturday and 2:30 p.m. Sunday at Schlow Centre Region Library. State College softball will host Williamsport at 11 a.m. at Community Field, with all proceeds, including concessions and T-shirts, will benefit the Jana Marie Foundation as the Lady Little Lions work to strike out the stigma of mental health challenges. The benefit was originally scheduled for Friday night's game against Central Mountain, but that game was postponed until May 13 because of rain. Pennsylvania singer-songwriter Aaron Bear is joined by State College musicians and indie band Sea Offs for the release of his full-length album "Let Love Transform," at 8 p.m. at Webster's Bookstore Cafe, 133 E. Beaver Ave.
Massachusetts-based Bella's Bartok bring a kaleidoscope of sound born of Americana and roots music to Elk Creek Cafe & Aleworks, 100 W. Main St. in Millheim, for an 8 p.m. show. The 10th annual Paterno Family Beaver Stadium Run steps off at 11 a.m. at Medlar Field. The 5k and 2-mile family fun walk benefits Special Olympics of Pennsylvania and finishes inside Beaver Stadium with runners and walkers entering through the players’ tunnel. Find registration and schedule details here. - Penn State's IFC and Panhellenic host their free annual Spring Egg Hunt for kids from noon to 2 p.m. on the Business Building lawn, University Park. - State College YMCA will hold an underwater egg hunt for children ages 3 to 12 from 1 to 4:45 p.m. Free and open to the community. Children must be registered in advance for heats by age group. Hear Edward Lengel, former White House chief historian and the 2018 Colonial Williamsburg Revolutionary in Residence Historian, speak about the founding of our nation, at 2 p.m. at the Pennsylvania Military Museum in Boalsburg. Lengel is an award-winning author and has contributed to several national radio and TV broadcasts. Book signing and purchase will be available at the event. Admission and parking are free. The State College Palm Sunday Peace Walk begins at 3 p.m. at St. Paul's United Methodist Church, 250 E. College Ave. The 1-mile walk, stopping occasionally to celebrate peace, is a collaborative campus and community event bringing us together to notice and acknowledge the many ways people are working for peace in our area. The Piano Recital Series at Boal Mansion Museum concludes its season with Amy E. Gustafson performing works by Brahms, Liszt, Chopin and Cimarosa at 3 p.m.
Pegula Ice Arena will host Penn State's 36th annual spring ice show, this year titled “Life’s Frozen Moments,” at 5 p.m. The show will feature skaters from the Penn State figure skating team, the Nittany Valley Figure Skating Club, and the Penn State Learn to Skate group lesson program. In addition to the local skaters, the show will include guest competitive pair skaters Jessica Pfund and Joshua Santillan. General admission $5 tickets are available at the door. Harmony presents "Beauty and the Beast" at 6:15 p.m. in Schwab Auditorium. Harmony is a Penn State performing arts program for individuals with and without special needs in the State College community, fostering a relationship between students and mentors as they work on singing, dancing, and acting. Admission is free, but donations are welcome. This Penn State School of Music event will feature a variety of works by female composers, and will include performances by marimba, brass, color voice and choirs. The free concert begins at 8 p.m. in the new Recital Hall, Music Building I.